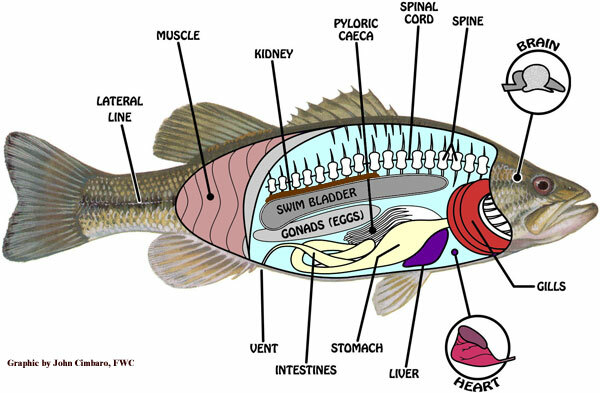 The following illustration of a largemouth bass shows some of the common internal features that are used to describe the differences between fish that are described in more detail below. As different as a man may be from a fish, both creatures share some fascinating similarities in basic structure and function. And the closer one looks, the more complex life becomes. The smallest units of life are microscopic cells, and some organisms such as an ameba are no larger than a single cell. In larger multicellular creatures, individual cells that are similar in structure and perform a specific function are grouped into tissues, and tissues may be grouped into even more complex and specialized structures called organs. These organs perform the basic bodily functions such as respiration, digestion, and sensory reception. Man and fish share such organs as the brain, stomach, liver, and kidneys. Other organs appear in different forms in different organisms; for example, the lungs in humans and the gills in fish are very different but both provide the same basic function of respiration. Finally, some organs (such as the fish's swim bladder) are simply not present in man. Below are descriptions of some of the organs identified on the above diagram, along with their functions. A number of other vital organs, such as the spleen and pancreas, may also be present but are smaller and more difficult to locate. 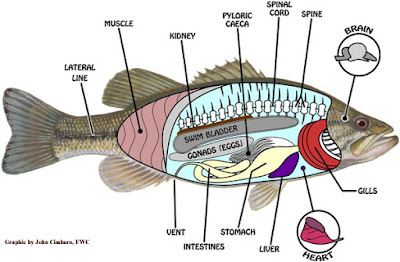 The primary structural framework upon which the fish's body is built; connects to the skull at the front of the fish and to the tail at the rear. The spine is made up of numerous vertebrae, which are hollow and house and protect the delicate spinal cord. Connects the brain to the rest of the body and relays sensory information from the body to the brain, as well as instructions from the brain to the rest of the body. The control centre of the fish, where both automatic functions (such as respiration) and higher behaviours ("Should I eat that critter with the spinning blades?") occur. All sensory information is processed here. One of the fish's primary sense organs; detects underwater vibrations and is capable of determining the direction of their source. A hollow, gas-filled balance organ that allows a fish to conserve energy by maintaining neutral buoyancy (suspending) in water. Fish caught from very deep water sometimes need to have air released from their swim bladder before they can be released and return to deep water, due to the difference in atmospheric pressure at the water's surface. Species of fish that do not possess a swim bladder sink to the bottom if they stop swimming. Allow a fish to breathe underwater. These are very delicate structures and should not be touched by hand. Filters liquid waste materials from the blood; these wastes are then passed out of the body. The kidney is also extremely important in regulating water and salt concentrations within the fish's body, allowing certain fish species to exist in freshwater or saltwater, and in some cases (such as snook, tarpon, salmon, etc.) both. Break down (digest) food and absorb nutrients. Fish such as bass that are piscivorous (eat other fish) have fairly short intestines because such food is easy to chemically break down and digest. Fish such as tilapia that are herbivorous (eat plants) require longer intestines because plant matter is usually tough and fibrous and more difficult to break down into usable components. A great deal about fish feeding habits can be determined by examining stomach contents. This organ with finger like projections is located near the junction of the stomach and the intestines. Its function is not entirely understood, but it is known to secrete enzymes that aid in digestion, may function to absorb digested food, or do both. The site of waste elimination from the fish's body. This important organ has a number of functions. It assists in digestion by secreting enzymes that break down fats, and also serves as a storage area for fats and carbohydrates. The liver also is important in the destruction of old blood cells and in maintaining proper blood chemistry, as well as playing a role in nitrogen (waste) excretion. Circulates blood throughout the body. Oxygen and digested nutrients are delivered to the cells of various organs through the blood, and the blood transports waste products from the cells to the kidneys and liver for elimination. In adult female bass, the bright orange mass of eggs is unmistakable during the spawning season, but is still usually identifiable at other times of the year. The male organs, which produce milt for fertilizing the eggs, are much smaller and white but found in the same general location. The eggs (or roe) of certain fish are considered a delicacy, as in the case of caviar from sturgeon. Provide movement and locomotion. This is the part of the fish that is usually eaten, and composes the fillet of the fish.